The seasons come and go each year at the same time, but that does not mean they are always predicable. We have all been caught off guard by an afternoon storm on an otherwise sunny day, or have been met with mid-day high winds despite a clear sky.While we are always trying to tailor our clothing to the weather outside, we never want to be caught off guard. It does not make sense to carry a heavy jacket with us year-round, nor should we leave the house without some form of protection from potential wind and rain, especially if we will be spending lots of time outdoors. Finding the best windbreaker is the ideal solution to unpredictable weather all year long. A windbreaker is the best compromise when it comes to guarding against bad weather. A windbreaker, sometimes called a “windcheater,” is a thin, lightweight jacket that protects us from wind and rain. It is usually made of a light, synthetic material, which is versatile for year-round use. It is thin and fits underneath larger coats during harsh winter months, but is durable enough to be worn by itself in warmer weather. It is a more suitable form of protection than a sweater because it is insulated. In wet weather, a sweater easily becomes soaked, making you and any clothing you are wearing vulnerable to water. In windy conditions, a sweater does not provide any resistance to the chill, as the fibers are not woven close enough to keep wind from passing through the open spaces. A well-designed windbreaker solves all the problems a sweater cannot, while protecting you and your clothing. Windbreakers are ideal for a variety of consumers. They are typically budget friendly, fashionable, versatile, and great for everyone from outdoor lovers to outdoor commuters. They are favored for many outdoor activities including hiking, biking, and running. This helpful guide will give you all you need to know about finding your windbreaker! What features to look for in a windbreaker? Windbreakers are typically made of a synthetic material. This means the fabric has been constructed in a laboratory out of manmade materials such as nylon or lycra. If you were to take a very close look at synthetic material, it would appear to be spun out of plastic instead of the cloth fibers we are used to seeing in organic materials such as cotton. This is ideal for the windbreaker because the “plastic” shell can protect you from wind and water. Usually, this is done with the assistance of a weatherproof outer coating. The most effective windbreakers are coated in a substance called “DWR.” DWR stands for “Durable Water Repellant.” It allows water to bead up on the outside of the coat, preventing it from seeping into the outer layer. Without the DWR coating, or a coating that functions like it, the windbreaker would be useless. Their lightweight, single layer design requires extra help to keep you dry, so never purchase a windbreaker that does not boast a water-resistant coating. Not all windbreakers come with a hood. It is important to consider what conditions you will be using your windbreaker in so you can decide whether a hood is necessary. If you do choose a hooded option, you should always try on the coat with the hood up. Check for any blocked visibility. You do not want the hood to fall over the eyes, or excessively block your peripheral vision. This is especially important if you plan to use your windbreaker for outdoor exercise such as running or biking among busy streets. Hoods with drawstrings are also favorable especially for “high wind” areas. The drawstring allows you to pull the hood tightly around the head blocking out any additional wind from the head and ears. Attached hoods are a great option if you would like a hood in some conditions, but not in others. Windbreakers are very simple in design, and not all include pockets. If you need to transport valuables with you, keep that in mind when browsing the different options. While many styles do have traditionally placed pockets, you may opt to select one that has a chest pocket. The chest pocket is a great option to consider, especially if you will be active with cash, credit cards, or personal IDs. The upright design of the pocket prevents items from falling out, and they are often secured with a zipper or snap. Zippers – Most windbreakers have a zip closure. Make sure the zipper feature is easy to operate and does not move easily on its own. Some zippers have material fastened to them which allows you to easily move the zipper into place. If this is the case, make sure the zipper you are using does not have material that gets in your way or can catch on other objects easily. Elastic Cuffs – Elastic cuffs can provide a more tailored fit of your jacket. They are helpful in windbreakers as they can block out excess wind from the arms. Chin guard – Some models offer a “chin guard” feature. The material will rise, like a turtle neck sweater to provide added protection around the neck and jawline. Drawcord hem – A drawcord hem is helpful when needing a more fitted style around the bottom of the windbreaker. It cinches tight to keep out excess cold weather. The windbreaker fit will largely depend on the style you like. Some options are larger, while others are described as “athletic” and will be more fitted to the body. No matter which style you choose, it is important to remember the windbreaker should not limit your mobility in any way. When trying on your windbreaker, wear it with clothes you would normally wear underneath. Move the arms and torso in motions that mimic the movements you would be doing while wearing the jacket. Make sure the windbreaker does not “ride up” or begin exposing your arms. You want to be able to move freely in the jacket while still feeling protected all over. A windbreaker is versatile for a lot of different lifestyles. When choosing your windbreaker think about all the reasons you may want to wear it and purchase one that best fits your needs. For example, runners favor brightly colored windbreakers. Some options include highly reflective fabric that keep runners safe at night. This style is great for avid bikers as well, as the fluorescent colors alert drivers to pay attention. 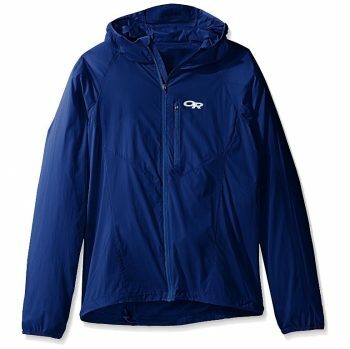 Many windbreakers are one or two colors and match with a variety of clothing well. Some options can easily be paired with layers, while others have a fit that is more suited to a one layer outfit. Think about your personal preferences in outdoor dress. Now that you have a good understanding about what makes a quality windbreaker, let’s take a look at the best options available to you! You have done your research and know exactly what you need in a windbreaker, now let’s get to the fun part. Shopping! Here are some of the seasons top windbreakers. Take a closer look and get ready to find the jacket you have been waiting for! Patagonia is well-known for its high quality outdoor wear. They value the connection between man and nature and this vision is clearly spoken for in the Houdini Jacket. This jacket is incredibly lightweight and functional. When not in use, it can be compacted into its own front zip pocket for easy storage. The DWR coating is of high quality and effectively stops wind and rain in its tracks. A repeat favorite of loyal Patagonia customers, this jacket is noted for its ultralight and slim construction and is ideal for a one layer outdoor outfit. The zippered front chest pocket is designed to hold slim items such as an iPhone or cash and credit cards. The hood is well-fitting and does not block the peripheral view. It is adjustable and cinches tight in one pull. 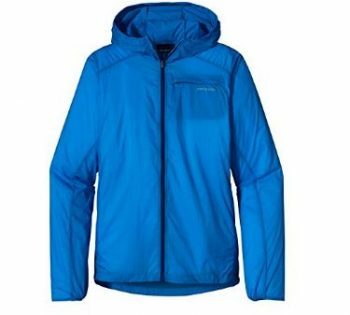 For those looking for a simplistic, straightforward design that is travel friendly and ultra-light, the Patagonia Men’s Houdini Jacket may be the perfect fit for you. Marmot has been producing high quality outerwear since 1974 and maintains their high standards with the Marmot Women’s Ether DriClime Hoody. Favorited for its soft insulation, this product will keep you warm and dry in a variety of weather conditions. The bi-component wicking lining, plus the mesh underarm vents, will keep the windbreaker breathable but dry. Customers love the inner lining as it is smooth and wears comfortably over short sleeve or long sleeve layers. This jacket is great for fluctuating weather. The attachable hood is perfect for customizing the jacket to your surroundings and the zippered pockets keep your valuables secure when not in use. This windbreaker boasts the ability to compact into its own pocket making it ideal for storage and travel as well. The athletic fit, as well as elastic cuffs and hem, create a flattering, well fitted look. If you are needing a versatile option that is comfortable, stylish, and ideal for unpredictable weather, look no further than the Marmot Women’s Ether DriClime Hoody. Salomon is known for its passion for outdoor sports, and uses up-to-date technology and high craftsmanship to create the best outdoor wear available. The Salomon Men’s Fast Wing Hoodie is a super light, high mobility jacket, that is windproof and rainproof. This jacket is favored for the active outdoorsmen and is worn by those who take part in running, trail running, and biking. The free range of motion favors any sports that requires agility in the outdoors. Its lightweight design prevents athletes from being worn down by excess fabric, and it easily stores into its own pocket. If you need a jacket that can keep up with your active lifestyle, this windbreaker will work great for you! 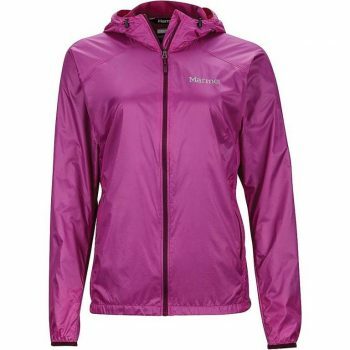 Arcteryx is an award winning outdoor brand, and this windbreaker won both Outdoor Gear Lab’s Editor’s Choice Award, and Climbing Magazine’s Editors’ Choice Award. 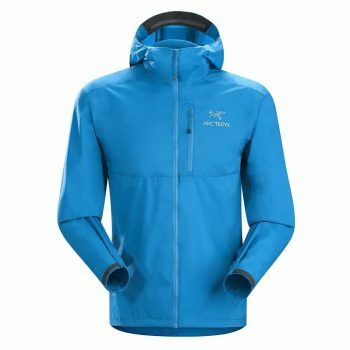 Arcteryx Squamish Hoody-Men’s Jacket is packed with Arcteryx technology including, Tyono 30 denier shell with DWR coating, and laminated die-cut Velcro cuff adjusters. Perfect for the ultra-active wearer, this jacket can easily be packed into its own pocket. The Storm Hood includes one-handed drawcords and can be worn underneath a helmet. This jacket provides exceptional range of motion and comfort and is designed to reduce bulk. Customers are loyal to the Arcteryx brand and are happy to find that this jacket stands up season after season. The athletic fit offers a slim profile and is raved about for its lightweight design. 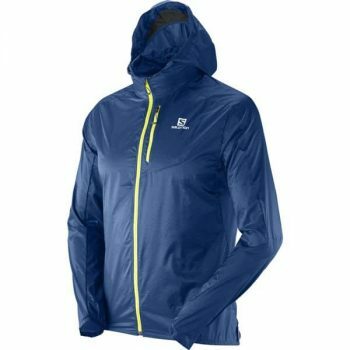 If you are looking for a flattering, easy to move in jacket, that combines quality and practicality, look no further than the Arcteryx Squamish Hoody. Outdoor Research is a company that prides itself on a passion for the outdoors, and focuses on the journey of life. Their values can be seen in each of their products, including the Outdoor Research Men’s Tantrum Hooded Jacket. This jacket is made for “highly aerobic pursuits,” and is breathable, yet protective from wind and rain. This windbreaker blocks out wind especially well with its adjustable fitted hood, and it is easily compactible into its own pocket. The lower back pocket can be used as a stuff sack and can be worn with a waist strap, or clipped onto a harness. This windbreaker is great for runners as it is available in a variety of colors including florescent, highly visible options. Likewise, the zipper pockets prevent your treasured items from falling out during high activity. If you are looking for a thin, breathable windbreaker, that compliments your fast-paced lifestyle, the Outdoor Research Men’s Tantrum Hooded Jacket may work well for you. 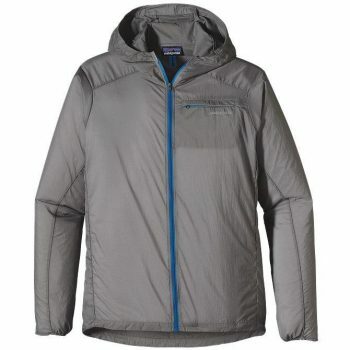 Another Patagonia options makes the list with the Patagonia Alpine Houdini Jacket. This windbreaker is perfect for climbers. It has all of the basic needed features, without any unnecessary accessories to weight you down. The philosophy behind the Alpine jacket is that “less is more,” and Patagonia achieves this all while maintaining their windproof and waterproof promise. They utilize a proprietary laminate and their popular GORE-TEX Active fabric to create a thin jacket with high breathability and extreme water resistance. This windbreaker includes all the necessary features for a successful climb including helmet compatibility, and self-stuff pouch. In extremely windy conditions, the elastic cuffs and single-pull adjustable drawcord hem can be used to keep cold weather out. This jacket is highly protective from harsh weather, but once it is clipped to a climbing harness, it’s hardly noticeable. If you are an avid climber, in need of a functional and straightforward windbreaker, this option is perfect for you! Rab is a brand that is focused on practical outdoor wear. It has created the Windveil Men’s Jacket to be exceptionally water resistance yet breathable, the perfect combination for any outdoor activity. The Super DWR layer is designed to last the lifetime of the garment, and all of features including zip pockets and chin guard are placed with practicality and style in mind. This jacket is adaptable and eye-catching. 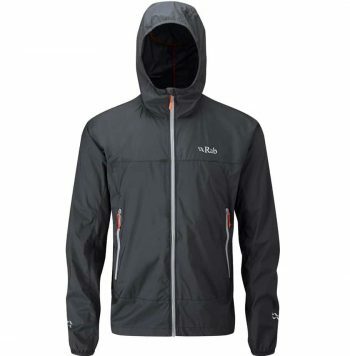 If you need a windbreaker that is designed with top technology and maximum functionality check out the Rab Windveil Jacket. This wraps up our overview of this seasons popular men’s and women’s windbreakers. Whether you are a runner, hiker, climber, or just plain cold, hopefully you have found an option that best suits you! Once you understand exactly what you need to look for when finding the best windbreaker for you, it becomes easy to weed out options that are not worth your time or money. Now that you are armed with lots of research and advice, you can make the best decision for you! Did you find this guide helpful? With this advice in mind, which windbreaker did you find that fits you best? Please let us know in the comments! Share this guide with your friends and families so that we can all be ready for the outdoors no matter the weather!